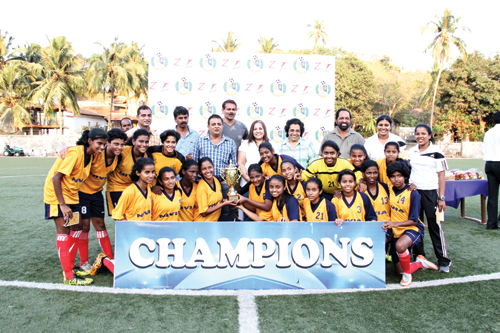 MAPUSA: Goa Women XI hammered Tibet Women’s football team club 6-0 margin to lay their hands on the prestigious Goa Women’s Football Festival cup, organized by GFA and promoted by Zest, played at the Duler stadium, here, on Saturday. The Goa Women side dominated major part of the proceedings, keeping their rivals pinned in their own backyard. Tibet had a fine run in the tournament until today’s encounter and found themselves trailing by a goal in the 10th minute of play through a fine solo effort by Valanka D’Souza to make it 1-0. After a series of missed opportunities Valanka struck once again for Goa Women, tapping in the ball from close range. Minutes later, Tibet went further down by a goal when Chonzom erroneously tapped the ball into her own nets. The introduction of Somaya Mukundan into the striking force paid the right dividends as the fast paced striker netted in three goals, scoring in the 28th, 35th and 48th minutes. Tibet had themselves to blame for the huge margin, as their strikers failed to score when it mattered most. Rodrigues, Co-founder and MD of Zest Concepts. Paul Fernandes compered and proposed the vote of thanks.